I grew up in the heyday of the long playing record, spent my babysitting years buying albums, made mix tapes like everybody else in the 80s, segued into CDs in the 90s, and then sometime in the 2000s, there stopped being records. By records, I mean physical copies of music with packaging, cover art, and occasional liner notes. Instead there was the mp3. Don’t get me wrong. I love mp3s and will fight for my right to use them. But I worry that if the incredible hard-drive erasing electromagnetic pulse ray is ever unleashed, a whole generation of music is going to cease to exist. What got me on this train of thought was a visit to our local charity thrift store, where browsing in the CD shelves, I found an artifact from the recent past that I could never have found had the artifact of the CD not existed. That artifact was a home burn of three eps by Stephin Merritt and friends, specifically I’m Lonely and Lonely Days by Future Bible Heroes and The New Despair by the Gothic Archies. At first glance, they seemed so out of place, I had to remember how I knew them, but then I did — they’re late 90s Stephin Merritt side projects. Merritt you will doubtless know from his work with Magnetic Fields, a band that made gothy misery and gorey-esque wordplay beautiful and cool. Well, almost. Cool until you saw them live and realized how incredibly awkward they were. On one occasion, at the Middle East Upstairs, Stephin Merritt played the entire show seated in a barber chair which he caused to swivel desultorily from side to side as he intoned the lyrics to his hits. There might have been a cellist too. 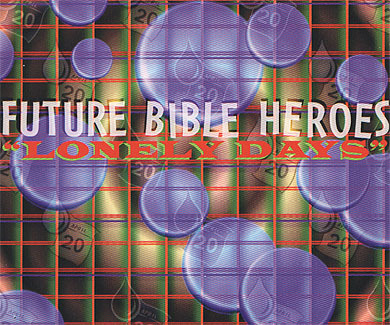 Future Bible Heroes is the more accessible of the two bands, with a sound in keeping with the Magnetic Fields. I especially like “Good Thing I Don’t Have Any Feelings,” Hopeless,” and “Lonely Days.” The Gothic Archies are a bit more experimental and decidedly dark, which is saying something, if you’re familiar with any of Stephin Merrit’s oeuvre. I’m glad I found these artifacts. I hope there will always be artifacts of things that are beautiful and by extension, cool.